Textkernel presents the infographic: The UK job market in Q2 2016, based on numbers from Jobfeed, the searchable job database for lead generation, competitive insight and labour market analysis. For this report, Textkernel analysed over 8.3 million job adverts posted in Q2 2016 found by Jobfeed across the UK web. After identifying and removing duplicates, as well as positions for franchises, internships/graduate positions, voluntary work, freelance jobs and apprenticeships, over 2.2 million jobs remained on which these analyses have been performed. Sales and trading has become the largest job category in the UK with 12.2% of all jobs. IT, which held 12.7% of all jobs last year, loses 1.6% market share and drops to the second position. Healthcare shows a very large increase in jobs. It gains 1.9% market share and climbs to place 3, at the expense of Administration and Customer service. The most requested professions also represent these job categories. 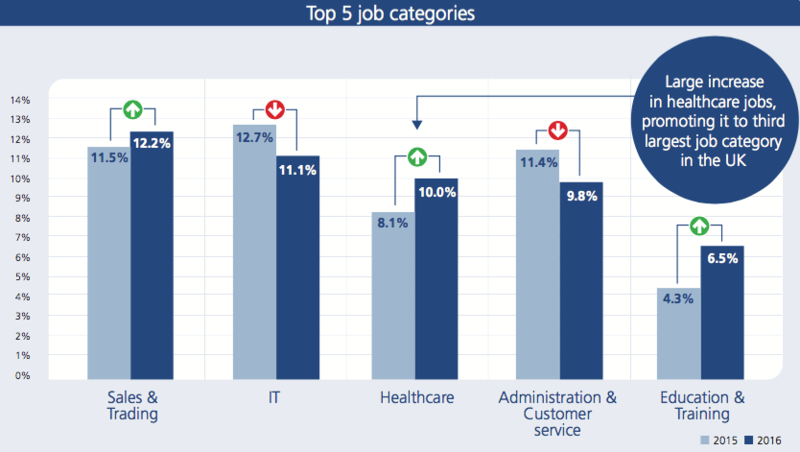 In the second quarter of 2016, Sales manager is the number 1 requested job, followed by Nurse and the Customer service agent. Curiously, the Software engineer is only spotted in place 10. While around 84% of the population lives in England, as many as 91.6% of all jobs posted in Q2 are positioned here. England even grew 0.6% in market share compared to last year. 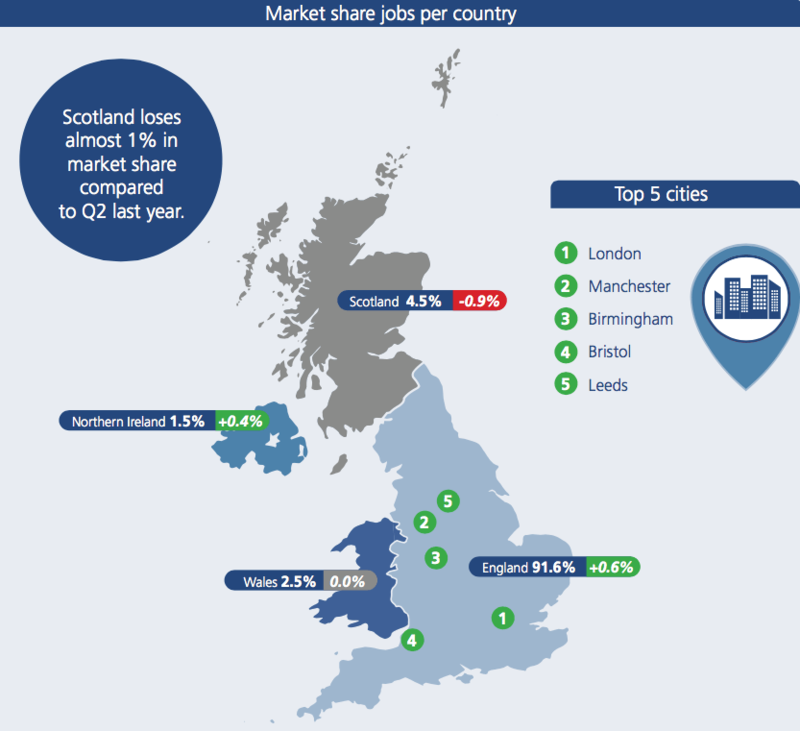 Scotland shows a loss in market share of jobs, dropping from 5.4% to 4.5% market share. Wales remained stable, while Northern Ireland also shows an increase (+0.4%) in market share. Unsurprisingly, the top 5 cities with jobs are all in England. Edinburgh (Scotland) follows in place 6.